The history of American graphic arts has never seen a better artist than Palmer Fanny. Popularly known as Frances Flora Bond Palmer, she was one of the best and leading artist for the famous nineteenth-century lithographic print publishers Currier & Ives. Palmer was born in the year 1812 in Leicester, England. She was the daughter of a reputed attorney and received her primary education in a girl’s school at Leicester. She married Edmund Palmer in the 30s decade at the tender age of twenty. Fanny soon started her lithography business along with her husband in the year 1842. The organisation was called “F & S Palmer”, where her husband conducted the printing work and Fanny looked after the art and lithography. However, it didn’t work out so well and they faced financial hardships. In 1843, the Palmers migrated to the United States and took residence in New York City. Fanny produced many varieties of lithographs not only for their company but also for other publishers. Fanny Palmer was seen as one of the best American graphic artists of that time. However, their business faltered and in the year 1849, her husband Edmund Palmer quit the family business. Edmund devoted all his time to shooting and drinking. The family suffered financial losses which forced Fanny Palmer to work outside. She soon found employment and was appointed as a staff artist by Nathaniel Currier. She used to travel all over America for her work and sourced material from books and even photographs to describe specific places for her drawings. Mr. Palmer became an alcoholic and fell to his death at their home in an intoxicated state. After his death in the year 1857, Fanny was the sole financial supporter of her family comprising of her two children, grandchild and also her sister named Maria Bond. The 19th-century American homes showcased many of the famed lithographs designed and created by artist ‘Fanny Palmer’. Apart from her world famous drawings, Fanny also worked on designed beautiful greeting cards, date calendars, and other books. Printmakers loved her wondrous artwork that was creative and ingenious. Sadly, her incredible artwork was left unnoticed by art historians for a very long time. Fanny Palmer was one of the most admired artists in Currier & Ives, where she produced almost two hundred quality prints on varying subjects. Some included picturesque farmlands and exotic suburban terrains, sports scenes as well as marine life prints. She even took on literary subjects, panoramic scenery themes, civil war topics, prints on railways and steamboats. According to Fanny, the whole world came to be viewed as an interesting subject for her prints. Her large quantity of original works was drawn, painted or lithographed by her. Some were inspired from on-site drawings. Lithography was just a part wherein she played multiple roles as a drawing artist, painter, and lithographer. True to her style, whenever she lithographed the work art of other artists and print-makers, she made a point to include the original artist’s name on the print. The lead partner of Currier & Ives company, James Ives played an important role in bringing Fanny Palmer’s artwork, that was done in her later life, to the forefront. He lithographed many of her prints. 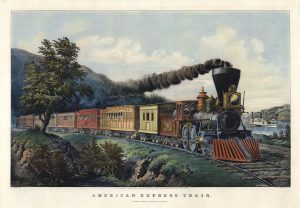 In fact, Fanny Palmer prints issued by their company Currier & Ives were some of the most popular artworks to have graced thousands of American homes and business centres. Even in this century, her amazing work has been reproduced several times on cards and calendars. Some of the lithographs and prints have become a national rage among the art lovers, representing the dreams of the citizens of United States. As an artist for the firm, Fanny was said to have been devoted to her work, neglecting her health and even her physical structure was deformed due to her constant bending posture while she designed her priced lithographs. Fanny was specialised in creating a mesmerising and arresting atmosphere in her drawings and lithographs, her beautiful scenic backgrounds and landscape drawings were appreciated by one and all. 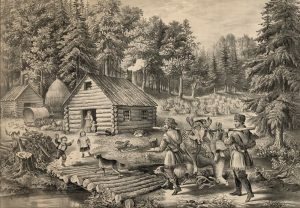 While creating hunting or wildlife scenery lithographs, she often used her husband and his dogs as inspirational subjects to recreate a hunting background and thus complete her work. Whatever the circumstances, Fanny as an artist could effortlessly bring out the best through her artistic work. Fanny Palmer signed many of her original works as F.F. Palmer. Her works have received critical and artistic acclaim worldwide. Fanny breathed her last in the year 1876, she was said to be suffering from tuberculosis. She was cremated respectfully in New York’s Greenwood Cemetery. Her employees had great respect for her and said she was a thorough lady with a subdued and modest attitude, holding real love for her artwork.